The harvest begins in Bodega Akutain after an exhaustive monitoring of the grape’s evolution in the vineyards, with the corresponding sampling and analysis, in order to choose the best moment. The small size of our vineyards and their proximity to the winery allow us to perform this track with great attention and to make the harvest in a very short period of time, once the grain is at its peak (neither too early, nor too late). We decide by maturity of the grapes the timing and the order of the vineyards to be harvested and we even select amongst the different areas in them. The harvest is done manually selecting the grape-bunches on the vine and depositing them in boxes of 20 kg. that are immediately transported to the winery to start the winemaking process as soon as possible (performing a final visual control and selection of the bunches prior to the stalking and the consequent separation of the stems). Both fermentations are carried out under controlled temperature in a manual and artisanal way (not automatic). 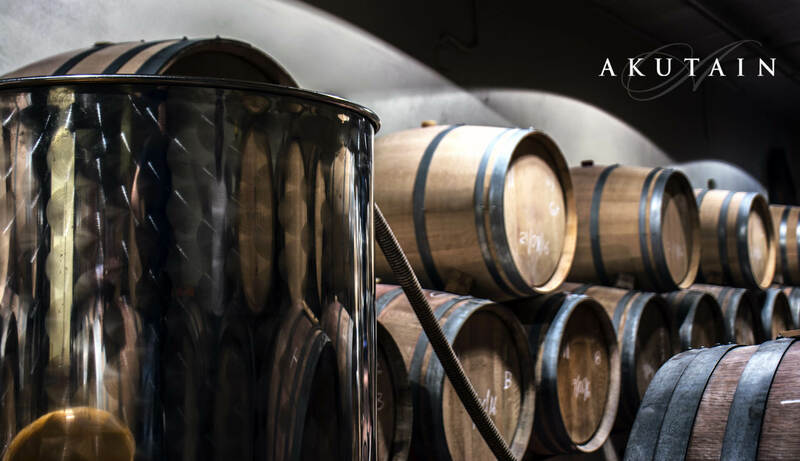 In Bodega Akutain we are very careful to maintain traceability throughout all this process, so that the product of each vineyard is fermented in a different tank, to care for and to keep the character of each wine. The wine obtained is separated from sludge (impurities), thanks to the action of time and coldness, by decantation and racking from tank to tank. Throughout the process, various analyzes are performed for control and decisions in the winemaking (options, timing…). Once fermentation is finished and after having rested in deposit most of the winter for a good decantation by natural cold, the wine is introduced in American and French oak barrels. The approximate proportion, like the great classics of Rioja, is of 70/80% and 20/30%, respectively. 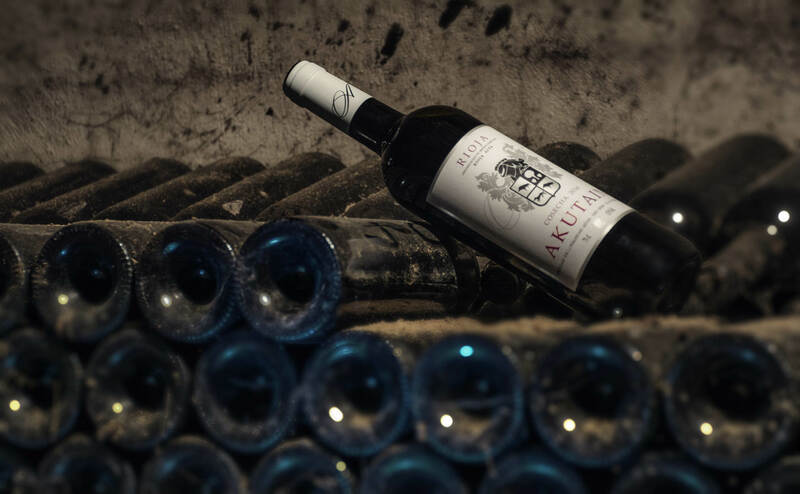 In Bodega Akutain we like to carry out a slow and long aging, being less aggressive and respecting in a higher degree the original characteristics and personality of the wine. For this reason we take pride in using barrels of the highest quality that we take good care of and whose life we extend as much as possible, since we are convinced that in a barrel happen many more things than just a simple transfer of tannins and “wood flavor” (more intense and easier to achieve with a greater proportion of new barrels, if that was our sole objective). This is only possible with an independent “barrel-to-barrel” racking system and with an ongoing monitoring through continuous tastings (and complementary analyzes) of each barrel. This provides us with valuable information when deciding on racking and on the moment of retirement of each barrel. The aging time in oak barrels varies from 14 to 40 months, with racking every 6 months (approximately), being these very important for the elimination of impurities that have decanted and for the oxygenation of the wine. The philosophy of keeping the traceability of each vineyard is also respected during the whole barrel aging process. The objective is to have the maximum information about each barrel and to be able to choose the proportion of each vineyard when carrying out the “coupage” of each wine at the time of bottling. Once the aging in barrel is completed, the “coupage” is carried out for each wine (selection of barrels that are going to compose it) and we proceed to it is homogenization in a tank. Here, the last impurities are decanted towards the bottom of the tank before of the bottling and the tannins are softened, achieving their stabilization in a natural way, without filtering. From here, the wine goes to the bottle, and these to our bottle racks located in cellars undermined in the rock under our own vineyards (expressly designed to preserve a particular ecosystem that maintains the ideal conditions of temperature, humidity, etc. for aging in bottle). The bottled wine will remain stacked in the traditional way as long as it is necessary until the right time for labeling, marketing and enjoyment has arrived.